We often see that a composer studies counterpoint, so I guess that it must be important. Can You Guess what counterpoint is? 1898 - Birth of American composer, pianist and conductor Ernst Bacon. 1953 - Premiere of Stockhausen's Kontra-Punkte for ten instruments, in Cologne. 1967 - Premiere of George Crumb's Echoes of Time and the River. It won the Pulitzer Prize. 1988 - Andrew Lloyd Webber's musical Cats opened in Moscow with a British and American cast. May 26, 1964 was the first performance of Aaron Copland's Music for a Great City from the filmscore Something Wild. London Symphony conducted by the Copland.Aaron Copland was born November 14, 1900, in Brooklyn, NY. He did not grow up in a musical family. His parents were Russian immigrants who never even went to a concert. By the time he was 9 Copland began making up tunes at his family's piano. After two years of fooling around on the instrument, he began to take lessons from his sister Laurine. No, counterpoint is not what I do when I have a particularly hard addition problem. Counterpoint is the art of combining two or more melodies to be performed simultaneously and musically. In counterpoint, the melody is supported by another melody rather than by chords. So when you sing Row, Row, Row Your Boat . . . if I come in at the right time it is counterpoint. If I come it at the wrong time it is noise. Virtual Sheet Music is a Service that Allows You To Instantly Download Classical Sheet Music Right to Your Computer. Try a Search and See What They Have Available! At age 14 Aaron began taking professional piano lessons. By age 15 he had decided to become a composer. His first steps included a correspondence course in writing harmony. 1917-1921, and began piano with Clarence Adler in 1919. In 1921, Copland went to Paris to attend the newly founded American Conservatory at Fontainebleau. His teacher there was Nadia Boulanger. After 3 years in Paris, Copland returned to the United States with a commission . . . writing a major organ work for his teacher to play during her American tour. His Symphony for Organ and Orchestra premiered at Carnagie Hall in 1925. By his mid twenties his work was known by other composers. After his return from Paris he worked with jazz rhythms in his "Piano Concerto" (1926). His "Piano Variations" (1930) was strongly influenced by Igor Stravinsky's Neoclassicism. Then Copland's music turned more simple. He began to gain inspiration from American legends and folk music. 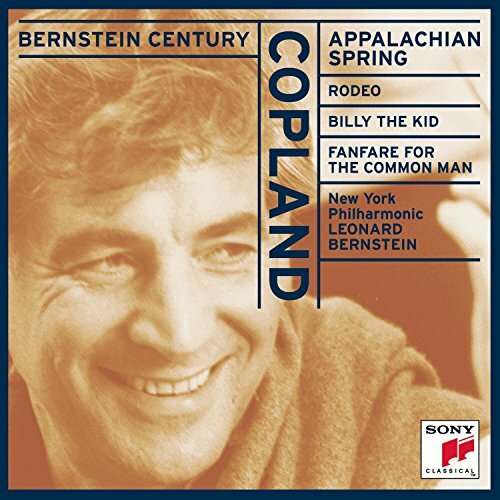 It was during this period that Copland wrote such classics as Billy the Kid and Rodeo. He also wrote the score for the film Of Mice and Men during this period. 1942 saw the premiere of Fanfare for the Common Man and A Lincoln Portrait. October 4, 1945, was the premiere of Aaron Copland's orchestral suite of Appalachian Spring ballet at Carnegie Hall. It was played by the New York Philharmonic conducted by Artur Rodzinski. His works evolved to somewhat reflect the tastes of the times. He even did some work using the 12-tone scale. After 1971 Copland stopped composing, but he continued to conduct and teach. He was very helpful and generous to other young composers, often promoting their music along with his own. Aaron Copland died December 2, 1990 in Westchester, NY.